It's easy to play up great features, excellent user interfaces and groundbreaking innovations in the world of technology. That's what's truly exciting for us grinding in this world day in and day out; it's a break from the monotony, so to speak. Augmented reality is easily one of the most exciting of these technologies, one that feels like it's just around the corner - and it's a technology that could very well check all those boxes. However, AR isn't going to replace anything if it doesn't have a killer app that makes people want to use it. That's not going to be navigation or literally augmenting our reality with information. It's going to be people; it's going to be multiplayer AR. The world has changed from the bygone era of consumer hardware. It's not enough to appeal to individuals to convince them to buy your tech product. You need to get them to buy your product, and then get their friends to buy it too. That's because social is the best way to lock your customer into using your product. Look at something like iMessage, which makes it hard for iPhone users to leave because they don't want to be a "green bubble." Or look at the modern history of video game consoles, where friends just buy the system the majority of their friends have so they can play online, something that console makers like to appeal to. Facebook has privacy scandal after privacy scandal, yet people stay because that's where all their friends are. Augmented reality is a technology that promises to layer important information on top of our world. When you come down to it, there's no more important information to us than our friends and family. We don't constantly use our phones because we're browsing the web or playing games (though we do that plenty). We constantly use our phones because we're talking to our favorite people. We're liking their photos, commenting on their fake news stories, retweeting their memes, watching their snaps and getting sucked into yet another WhatsApp group. 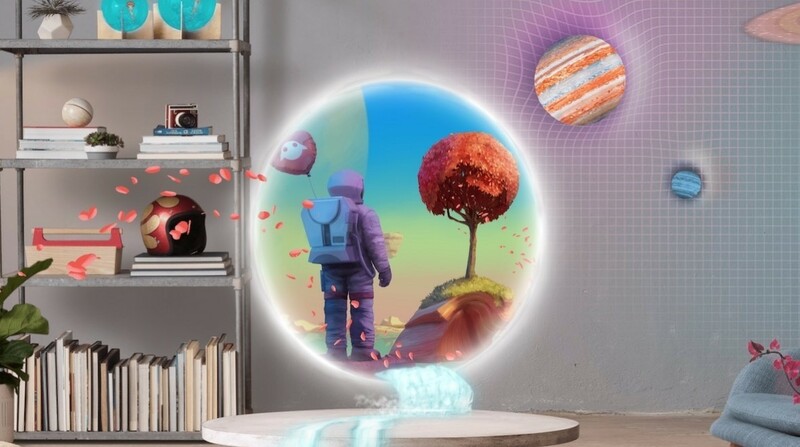 If AR wants to completely change the way we look at computing and replace the smartphone, as Magic Leap and others believe and hope, it's going to need to find a way to become our primary way to converse with our favorite people. We've already gotten a taste of this with Pokemon Go, which allowed a huge group of people to go out in the world, have fun together and look for weird little creatures hiding in random spots. The problem with Pokemon Go at its peak was that while we were in the real world together, we weren't in our augmented worlds together. It was completely disconnected. That needs to change, and to be fair Niantic, Apple and Google - the holders of Pokemon Go, ARKit, and ARCore - realize that they need to make it as easy as possible for people in AR to play together. But go further than that. Imagine if two people could fight each other with lightsabers in Jedi Challenges. It can't just be consuming content, like videos, either, it needs to be about being able to manipulate the same content together - creating a shared experience that can turn into a shared memory together. At the end of the day, we use technology to augment our own human needs and wants. There's no better way for AR to succeed and succeed quickly than to find ways to easily augment our social lives.